With expectations that Malaysia’s 2018 Budget will focus on people-centric and SME benefits, Malaysian freelancers are among those who will potentially be the most impacted by tomorrow’s announcement. While 30% of the global workforce is now reported to be pursuing freelance opportunities, the Employees Provident Fund (EPF) in August 2017 reported that the Malaysian freelancing economy has also grown by 31% – making it the third largest freelancing market in the region, as reported by Freelancer.com . To understand the growing adoption of freelancing as a career and recognising the role of freelancers in shaping the Malaysian economy, INTI International University & Colleges commissioned a first-ever survey of 300 full-time freelancers who represent professional fields of work including business, marketing, IT and computer science, culinary arts, and art and design. The survey uncovers insights on the freelancing landscape in Malaysia, as well as the potential role of tertiary education institutions and the government in responding to the growth of this sector. 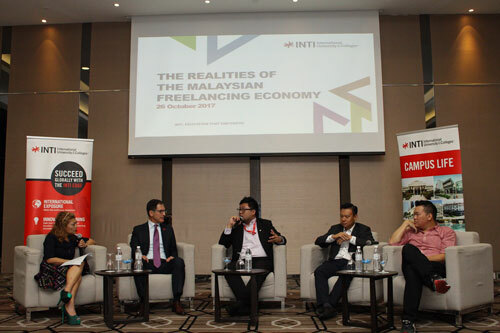 Commenting on the survey, Timothy Bulow, CEO of INTI International University & Colleges said, “The freelancing economy is changing the way we think about careers and has expanded job prospects beyond traditional employment. With young professionals opting to freelance in spite the availability of full time work, the impact of this shift must be given serious consideration if we are to leverage these talents in advancing Malaysia’s economy. Subsequently, the significant gaps in the professional development and financial stability of these individuals, both of which were revealed in INTI’s survey, should be addressed to support the long term sustainability of those opting to pursue such careers.” To further deliberate the survey findings and uncover the realities of the freelancing economy in Malaysia, INTI organised a panel session with Bulow and industry partners, including: Wong Theen Chuan, Deputy Manager for the Strategic Management Department of EPF; Melvin Lim, CEO of Trisilco IT Sdn Bhd and an INTI alumnus; and Lau Chak Onn, Editor-in-chief at Cilisos Media Sdn Bhd. In addressing the advantages of freelancing, both survey and panel found that freelancers are in a unique position to make choices in what they want to do rather than being tied down to a scope of responsibilities. This created diversified work exposure, enabling freelancers to learn new skills and insights from client to client. As dynamic and versatile professionals, freelancers could become real assets to organisations and the economy as they leverage a broad perspective of ideas when engaged in projects. In spite this strength, however, there are still gaps in the opportunities and development of freelance professionals in the country. In spite the growing popularity of freelancing, long term financial sustainability remains one of the critical concerns for freelancers, with 66% of respondents to the survey not having a retirement plan, while 33% do not have a personal savings plan. These findings support EPF’s recent call to the government for the need of more incentives under retirement savings schemes, and highlights the need for improved financial literacy among Malaysians. Subsequently, 65% of freelancers ranked government recognition of freelancing as a formal career as the top of their Budget wish-list, indicating that this would enable them to apply for social security, loans and capital that would facilitate their financial sustainability. Other significant skills which more than 80% of freelancers found crucial to their success were communications, interpersonal skills and problem solving skills. Further to this, 58% of respondents also felt that tertiary education had not sufficiently equipped them for freelance careers, suggesting that the Malaysian education system is not doing enough to prepare this new generation of professionals who are opting to move beyond traditional employment. Bulow explains, “With continuous changes in the job landscape and economic trends, institutions of higher learning must reinvent their education offerings to meet the widening scope of employability. To ensure that we are preparing our graduates for diverse careers, INTI collaborates with over 450 industry partners in providing practical learning based on market needs. Integrated modules from IBM’s Innovation Centre for Education, Alibaba’s Global Ecommerce Talents programme, and Google Ignite enhance digital literacy and help students to gain expertise in digital marketing and e-commerce – skills that help them build their online portfolios and market their services to future clients. 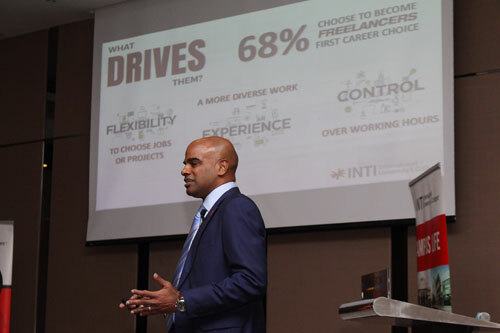 As an institution committed to outstanding graduate outcomes, INTI recognises the impact of freelancing in the growing scope of employment and is reinventing education to equip young professionals with the skills needed to thrive in the jobs of tomorrow. With forecasts that Budget 2018 may see further incentives for SMEs to stimulate growth, this survey serves as first steps into what relevant parties can work on to improve and prepare the next generation workforce for this future economy.